The new Jaguar crossover concept is out! What seems to be is that the dubbed CX-17 looks like an XJ’s brother that has been hanging out at the local gym too much. 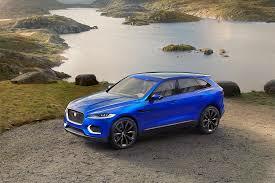 What firms calls a way to “introduce Jaguar’s new, high-advanced, modular architecture” and also a design to illustrate “the diversity of vehicles that could be produces using this architecture, which underpins he innovative future of the Jaguar brand”, is the first crossover from the company. Jaguar’s design director Ian Callum, who admitted that he has been reluctant to produce such cars and is doing it for the love of SUVs and SUV lovers all over the world also told that the new Jaguar CX-17 is targeted to the young generation who aspire to own an SUV! The luxury British manufacturer claims that this is going to be one driver’s car. Essentially Jaguar! Upcoming Jaguar takes a whole lot of design cues from Jaguar’s road car range. Front façade that features a large single frame grille and slim headlights is a take on the current XJ’s face. However, two gigantic nostrils lit by diffused LEDs make the new CX-17 look like a beast ready to roll. When it comes to what the rear of the upcoming SUV looks like, it screams Jaguar F-type out loud. Pronounced rear launches and the horizontal tail lights mark the influence of the same. The originality bit comes from a twin exhaust, a roof spoiler and 23-inch alloys which also emphasize the SUVs sporty intentions. Focused, chic and minimalist, the interior of the car firstly features four individual bucket seats each of which is embossed with a laser cut dog-toothed pattern. There are “leisure” seats, two of them that pop up from the boot floor which are a treat to your tired body to perch when you park up in the middle of a long drive. The dashboard is simplistic and houses a central screen and a touch sensitive control panel. The center console is one large touchscreen in itself that stretches back to the rear passengers and is called the Interactive Surface Control. Jaguar intends to offer both super-efficient diesel models that emit less than 100g/km of CO2 as well as the high performance supercharged petrol V6 engines also used by the F-type, capable of achieving 186 mph. The CX-17 sports a rear-biased intelligent all-wheel drive system. Fine and tidy handling that comes with the all-aluminum suspension is what is to be expected. The sinister-looking LED flashlights on the face of the monster with a prominent upright black mesh grille, a muscular contoured bonnet and grey plastic skirting beneath the bumper all of it gives the new Jaguar just the right brawn it needs to step into the premium market of SUVs. 4.7 meter long, 1.6 meter high and 1.9 meter wide, the CX-17 targets the Audi Q5 and BMW X3 right away! And it’s not a surprise why Jaguar took aim at these cars for this is the fastest growing and largest market sector for luxury SUVs.